Lot Detail - 1861 Prince of Wales Albert Edward in Red Velvet Oval Case. 1861 Prince of Wales Albert Edward in Red Velvet Oval Case. 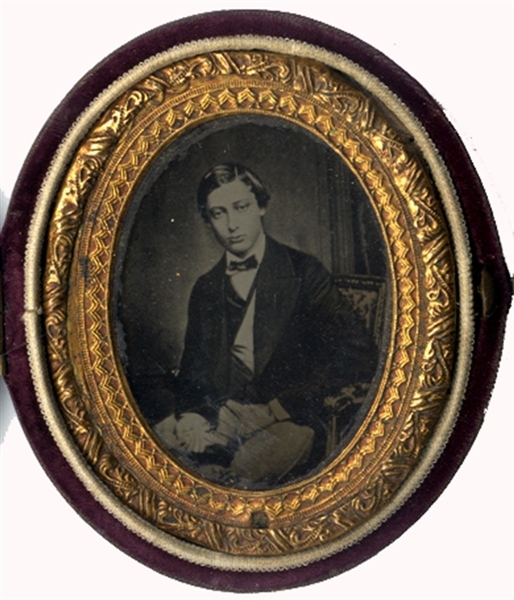 Oval Ambrotype of Prince of Wales Albert Edward, c. 1861, 1/16th plate, housed in red velvet oval case. There is an ID card in the back . "Albert Edward, Prince of Wales. Commemorative of his visit to America ..... Geo. Clark, Ambrotype Artists , Boston .." Fine condition.